These adjustable sheet straps are most effective as the alligator clips grip securely. My husband is a "wild" sleeper and will pull the fitted sheet off the mattress during the night. These hold the fitted sheet on all night. These adjustable sheet straps are much more effective than other types. These straps have alligator clips rather than the slide-in holders and handle quality sheets without coming loose. The slide-in holders frequently pop off and don't hold the sheets to the mattress -- totally a waste of money. I'm not sure why this review asks if I'm a pet owner. This product is used with bed sheets to keep the fitted top sheet on the mattress. Finally my sheets stay on the bed. I have an electric bed. When it is re-positioned, the sheets pop off the corners. These straps clip to the edges and hold firmly so the sheets stay on the bed through all the movement. The metal clips hold very well, much better than plastic/rubber clips on other similar items. I used it to hold a slippery tablecloth to the table. Just clipped ithe two sides under the table. Stays in place now! Your people offered FREE SHIPPING for my next order and DOES NOT WORK. Keep your sheets on the bed with adjustable sheet straps. Adjustable straps can be used with different size sheets or other things. They can also be used to keep ironing board covers in place. I love the fact that they are adjustable. I bought regular elastic straps before I purchased these. They were too large for the area and couldn't be adjusted. what the hell are the pet questions for. These work on both knit sheets (our fav!) and cotton sheets. Snug as you like them. Nice for fitted sheets that are loosing the elasticity too. Suggested if you have an extra deep mattress or added mattress comfort pads, these are really helpful. Sheet straps for the bed. I have fitted sheets, but, without the sheet straps,the sheets ride up and bunch up. With the straps the sheets or whatever you use the straps for will always fit better! Thank you for the prompt service! My husband seeps in a hospital bed and the sheets would not stay in place so I purchased a set of the straps and put them on the sheet I used all 4 from side to side from top to bottom. This is the very best quality sheet straps I've ever seen. The elastic is of excellent quality and the metal "grabbers" hold very firm. They adjust to a wide variety of lengths. 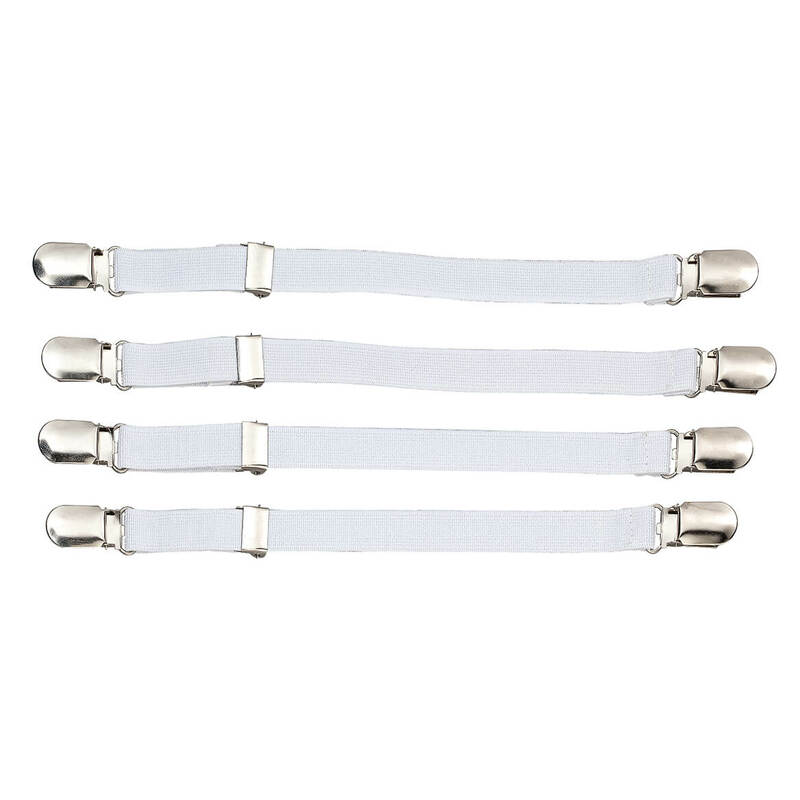 I purchased these to hold the corners of my fitted sheets on.They work well.With my clumsy fingers it would be nice if the clasps were a little larger with a larger mouth. This product is perfect for our sheets now that we have a mattress topper the sheets haven't stayed in place until now! I have been looking for something like these for a while! I am glad I purchased them. These work very well. Simply stated, my sheets don't pull up anymore. I toss and turn at night, and so I need something that will keep my sheets in place. Definitely a great find! We cut off the end and clipped 2 together and used it across the bed from one side of the mattress pad to the other. 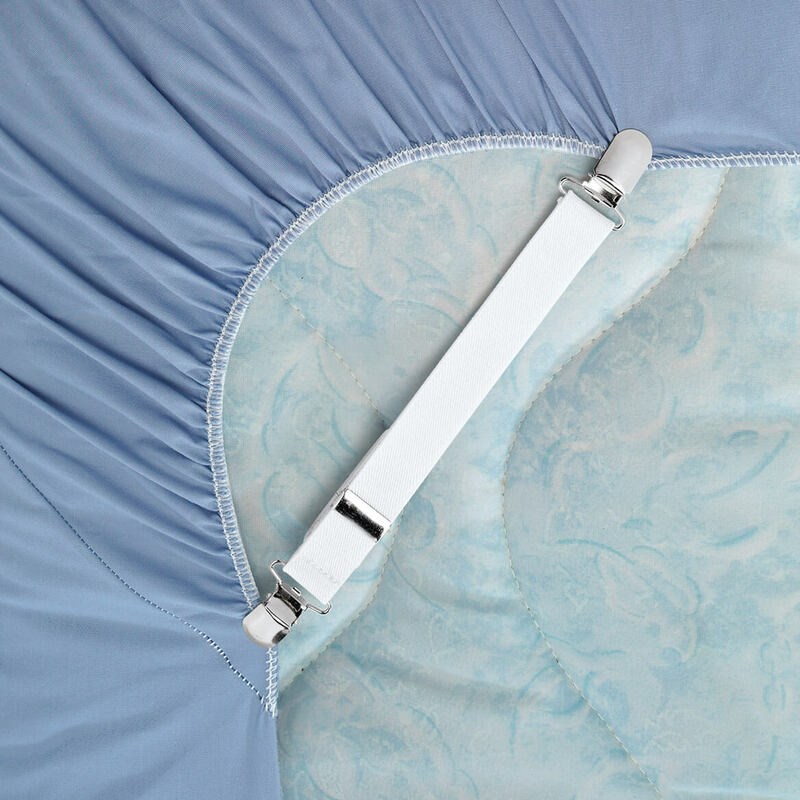 Two of the connected straps keep the mattress pad smooth under our sheets! I am using these to keep our toilet seat covers on. They are great and adjustable. Some of my sheets are a little too shallow to stay in place. These little helpers do a great job of holding the corners neatly. I'm so glad I found them! I have been looking everywhere for this kind of strap! All I've found, up until now, has been made out of a hard plastic which eventually breaks so when I saw this strap with the metal, I was very pleased! I use this in several different ways other than its intended and am pleased to know I can always order more! The straps hold my sheets very well. I love the use of them and I am glad that I got them. There is nothing that I would change about them. Work great, keeps sheets snug. 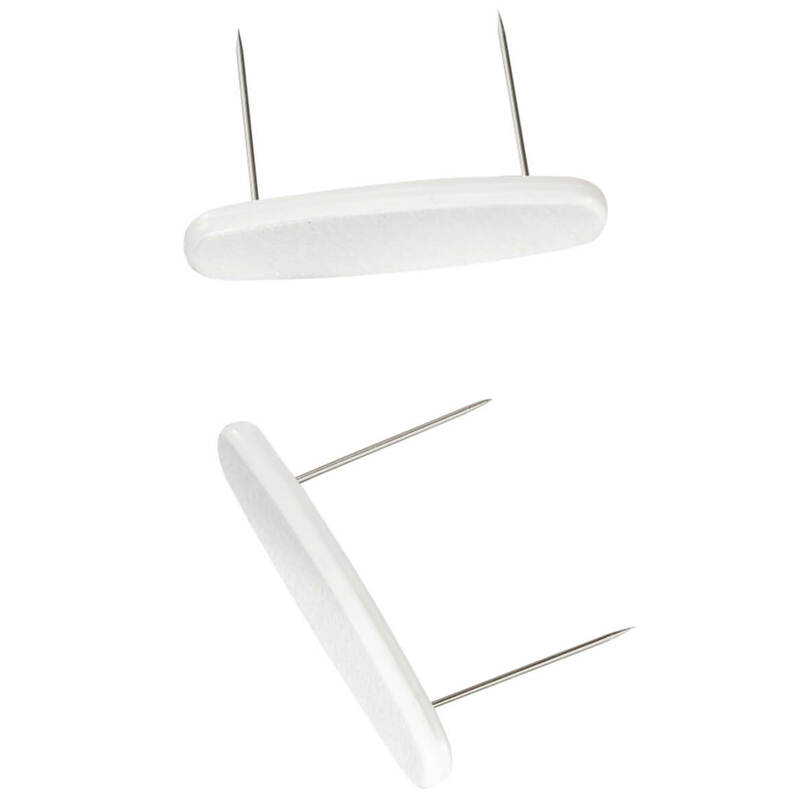 These are the most simple solution to a problem with the corners of the bottom sheet coming up and off the mattress. Previous to this the first night after putting the clean sheets on the bed the bottom mattress would come loose and get all messed up. Now, every morning the bottom sheet is where it should be. It still requires a little tucking but very simple now. I have tried other products and they did not work at all, but these I have not had any problems since I put them on. Love them. Do what they're intended to do! I use the straps to keep the sheets in place on our deep mattress. They are effective in what they do...can't get more basic than that. I really like the metal clips. Very pleased with these sheet straps, especially good for satin sheets to keep them from sliding off the mattress. These straps have helped me totally do away with a problem I have with my bedding getting rumpled as I sleep at night. As a restless sleeper it doesn't take long for the bedding to get rumpled and uncomfortable to sleep on. They also make it easier for me to wipe crumbs and grains of cat litter off of the bedding so that it is comfortable to lounge on the bed. 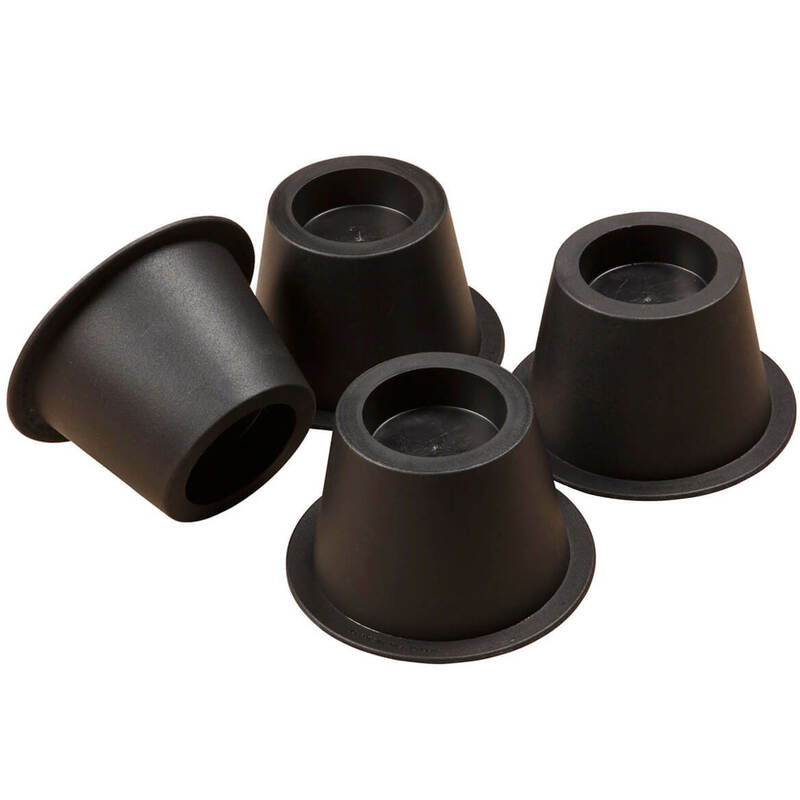 For anybody that has a problem with bedding rumpling these are great in that they prevent that from happening. I would recommend these straps to friends and family in a second. These are super easy to use and they stay on the mattress. I've bought others that won't stay on and that's if you can even get them on. These are awesome and I would definitely buy them again. Now I know where to find these! I think you've messed up on the selections, but these are sheet garters and they are wonderful! It is so difficult to find them made of metal but yours are...and they haven't slipped once! Everything, every order has great. I use these for my fitted sheets that are not deep enough for my new mattress. Works great. I have used these for years so fitted sheets stay on good since with mattress topper I have added, the corners of most sheets don't stay on or fit. They are great and love them and recommend to anyone. I USED THE STRAPS FOR AN IRONING BOARD COVER ,THEY WORKED GREAT . You are the only place that carries this type of sheet stretchers. They Are the only ones that really work. They have the crocodile grips and are much easier than use. wHAT DOES PETS HAVE TO DO WITH SHEET STRAPS? This is the ONLY place I could find the "alligator" type of sheet straps including local stores! They're SO MUCH EASIER to use than the "nylon hose" type. I like my sheets to be tidy. I'm hoping these will work. To keep my bottom sheets in place. I am tired of them "crawling" out from between the mattress and box springs the fitted sheet is wrapped around my feet. Hope these does the trick and holds the fitted sheet in place. My sheets want stay on the mattress, so hopefully these will keep the sheet on the bed. It was free, I didn't choose it. Love plants and the Chanel bedspreads . these were free with purchase of bedspread. I have an LA King size bed & it is difficult to find sheets that fit it. At times even the LA King sheets don't fit properly and I find myself altering them. I have to find hotel quality sheets and usually pay a lot for them. Sometimes I don't feel like sewing so I decided to use the straps since they are reasonably priced. Love these I use them always. Super product !!! I didn't order sheet straps , I ordered flour and sugar containers. This item does keep sheets in place. To keep the bed sheets from sliding down from the head of the bed. They do the job. Convenient way to purchase these. My husband can not keep a sheet on at the corners but I'm afraid these didn't help. He pops these right off. I had some before and need more got two new beds. My new microfiber sheets like to slide off the corners, hope these help. sheets keep falling off the bed. To help keep bottom sheets in place on our beds. many fitted sheets are baggy. Want to tighten them up. I did not pick this Item it was on my order. I have used these for years and they keep my sheets in place with no trouble, giving them to my daughters for their beds. Need to keep my sheets tight and not look like wrinkled rags. because even fitted sheets don't stay in place. My bed sheets keep popping off the mattress corners. I hope these will take care of that situation. I was looking for something to hold my bottom sheet a little more tightly to the mattress after being slept in. Because my sheets are stretched out. This is the kind of item that is hard to find in stores but practical enough that it appears in Miles Kimball! I think I'd seen them when paging through a catalogue some time ago and -- sure enough -- there they were still being offered when I needed them. We hava futon, bed -- not a standard mattress + box spring -- so sheets sometimes don't fit well. I wanted the straps that had plastic clasps. Unfortunately, the ones I received had metal clasps with teeth that would have torn my sheets. I would have returned them, but it would have cost me more in postage to return them than to keep them. Keeps my table cloth in place, especially when grandkids are over! Good price. They do stretch out and have to be replaced after a time. Thought this will help with slipping sheets!!! JUST WHAT I NEED TO KEEP MY SHEETS NEAT! Could not find them anywhere else.